for prep supplies (pre-Human transport). You do realize that the Sky Crane Mars landing system utilizes aero braking and a very large parachute to do most of the deceleration. 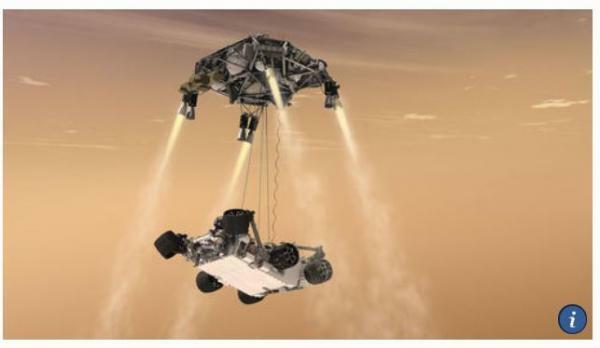 The brief rocket powered landing phase is for terminal touch down of the rover and the removal of the rover carrier from the landing site. Yes, that looks like the safest solution. That will mean it needs to carry additional propellant for the deorbit burn. Total is 731 m/s to LLO and 25 m/s for PDI or 756 m/s total. For 4 t empty mass and methalox propellant (380 s Isp), that would require 0.9 t of propellant. Theres been papers before studying disposal from DRO or NRHO, with Earth intersecting, lunar intersecting, or heliocentric disposal all for departure dv under 10 m/s. It takes >3 months (years in some cases), so its less than ideal for cargo return (not entirely out of the question though), but for getting rid of a dead expendable cargo vehicle or upper stage, its perfect. This is what a 70 m/s burn does to an ~100,000 km altitude ~13 day elliptical polar orbit. Impact speed is higher than a disposal from an intermediate LLO (which you want as much heating as possible). The trajectory at impact is also more normal to the surface than LLO and PDI. I would imagine that means the debris field will likely be more contained. You also over time get disposal areas near the poles that are artificially enriched with spacecraft materials. One question I have with NASA's architecture is how the Refuel Element vehicles are disposed of. Just leave them to drift about in NRO? This is the fundamental problem with reuse in cislunar architectures. A refuel-able tug is good and great, but since a tug is basically a fuel tank, an engine, and a docking port...and that's what a refueling vessel is too...you're expending something anyway. So you might as well just launch a new tug in the first place. It's different, of course, if you put a heat shield on your refueling vessel and aerobrake it back down to LEO. Then you can have it rendezvous, refuel itself, and repeat. But that doesn't appear to be in the works. Design the propellant tanks "wet lab style" so they can be used later. Use a cargo lander to take empty refuel elements down to the surface and use them for additional pressurized volume at a lunar base. Hardware placed in lunar orbit will be a valuable resource. Of course, there are trade offs. How much would it cost to convert, is there enough usable volume, etc. There will be additional cost to dispose of the refueling elements since deltaV isn't free, so reuse might be viable considering the cost of sending new habitat modules. The other solution is to put the burden on the one vehicle which must be expended every time, the descent stage. Here's a thought. The ascent stage is going to be a recurring problem because it needs to carry enough space and resources for the whole sortie, and it needs an airlock, etc. ; which adds mass. What if the ascent stage was much smaller--more like a taxi than a tour bus--and had its docking/transfer port in the floor? Each descent stage would have both an airlock and a permanent surface hab which doubles as storage space + extra stretch room for the crew on the downward journey. The descent stage assembly carries enough fuel to boost itself from GTO up to the moon, brake into NRO, rendezvous, mate with and refuel the ascent stage, and then deliver the ascent stage to the surface. This architecture means fewer launches and it leaves a new, permanent hab on the lunar surface with every mission. All you need, then, is a pressurized rover on the moon to transfer between your current lander and whatever other hab you want to access. Each new landed hab can have a specialized mission; one would be a lab, one would be storage, one would be a mess hall, one would be showers, etc. Then again, Steven's question might be another sign that Gateway architecture is fundamentally flawed. Another add Ixion hardware to them and use them as extra space or just fill some of them with trash to be disposed of. What if a company, aping Constellation, proposed a single-stage refuel/transfer/descent/landing vehicle which would be assembled by that company in LEO before its TLI, with no logistics launches required? Then you only have to brake a single stack into cislunar space for each lunar sortie. You'd still reuse the same ascent vehicle, of course. Second, is this the first sign of Marshall getting ready to design the Ascent Element? and assess lunar transportation system conceptual designs. elements by exercising the top-down framework in response to the configuration trade scenarios. • Provide model based design and large integrated system assembly management and expertise. • Provide conceptual models that work within the top-down design framework. • Provide photorealistic 3D renderings of conceptual designs. • Participate in daily architecture meetings. • Monthly technical status report in contractor’s format. Such a move would further nail down that such an element will be a "traditional" full-NASA-control vehicle. Thirdly, I just want to reiterate that this endeavor (the design and construction of the Refueling Element, the Descent Element, the Transfer Element, the Ascent Element, and the Surface Suit) is planned to be developed with $1B over the next five years (through 2023, with an ostensible launch of the Descent Element in 2024). $1B towards landing humans on the moon, spread out over the next five years. * CLPS and its ~15kg payloads will receive approximately the same amount over that five year period (~$0.95B). * Gateway will receive $2.7 billion dollars over the same period. * SLS/Orion is projected to receive $18.8 billion dollars over that time. I don't think that's enough if NASA wants to get to the Moon by 2068. Where did the $1B over 5 years come from? 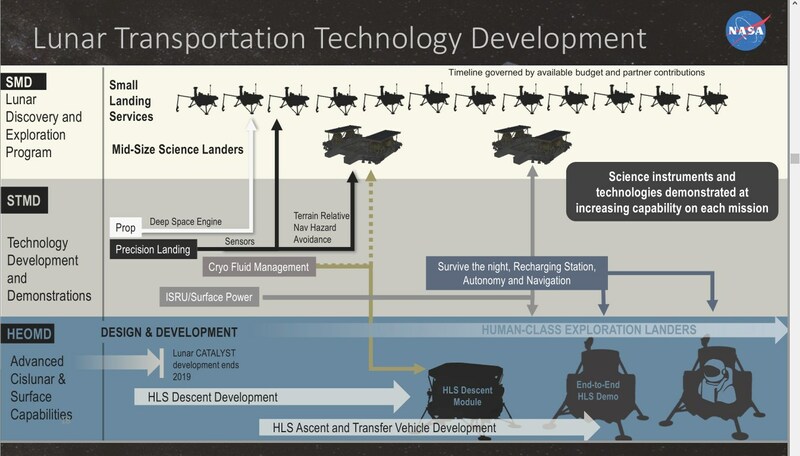 The Human Lander System (or, using the language in the linked PDF, the Lunar Transportation System) is funded out of the ACSC (Advanced Cislunar Surface Capabilities) line item (this was made clear in the HLS Industry Day slides). ACSC currently gets $1.05 billion over the next five years. CLPS+payload dev being ~$0.95B was computed by finding the LDEP line item and subtracting ~$20M per year for LRO operations and ~$3M for Apollo sample analysis, leaving the lander and payload development programs. More on that here. One thing I'd forgotten about was there being a big 2020 NASA budget announcement Monday. So the above constitutes the course they've plotted as of right now, and in just a few days there's a good chance we'll be able to see if they've meaningfully deviated from that. I would pay more attention on what’s in the FY2020 budget to get a sense on whether HLS is properly funded. With the (requested) budget out now, we can see how they'd like to change things. 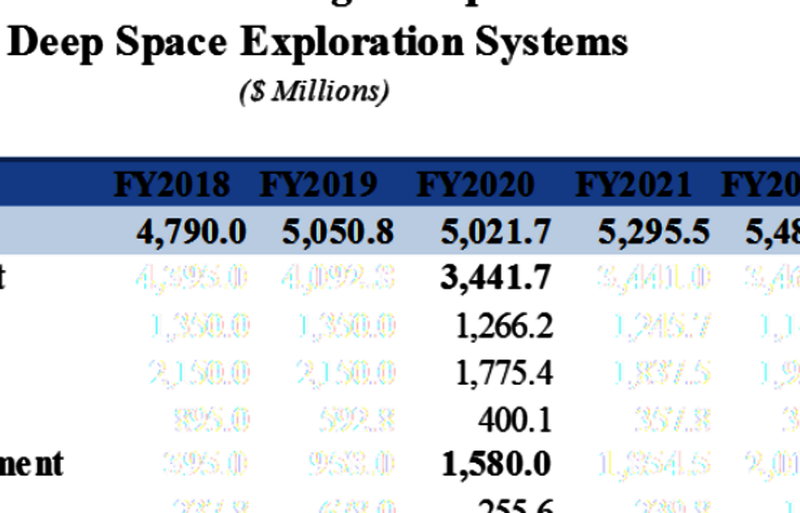 I've attached the planned exploration budget numbers out to 2024 below (cross posting them from the 2020 budget thread). Note that the 2020 numbers are public, but the projected numbers past 2020 for these specific line items were redacted (poorly) on the fact sheets. I unredacted them. So $363M right now, and they'd like to ramp up to $2.3B a year by 2024, which is roughly what SLS has been getting. $6.2B from 2019-2024. NASA administrator Jim Bridenstine talks about returning to the moon and building a Lunar Gateway. NASA is going to the Moon and on to Mars, in a measured, sustainable way. Working with U.S. companies and international partners, NASA will push the boundaries of human exploration forward to the Moon. NASA is working to establish a permanent human presence on the Moon within the next decade to uncover new scientific discoveries and lay the foundation for private companies to build a lunar economy. The lunar surface will serve as a crucial training ground and technology demonstration test site where we will prepare for future human missions to Mars and other destinations. Through an innovative combination of missions involving commercial and international partners, robotic lunar surface missions will begin as early as 2020, focus on the scientific exploration of lunar resources, and prepare the lunar surface for a sustained human presence. JOEL ACHENBACH (The Washington Post): 300 and how much million for lunar landers in this budget? ANDREW HUNTER: 380—63 in '20, but it quickly grows up to $2.3 billion in '24. that point, and so we'll be taking those dollars and ramping up ACSD with them as well. we're going to have to go off and work in consecutive budget cycles. Despite the above, unless they're going to really change those out-years from what they had internally very recently, I can't see how a significant amount of 2024 human lander system money comes from Gateway. At most, maybe $200M of that extra $2.0B comes from Gateway and associated Advanced Exploration Systems funds. $250M seems to come from Orion, $100M from ISS, and $500M from the Science budget (this looks to be done by having most of Clipper dev funds leave Planetary Science upon launch, assuming the James Webb dev funds will be available to redistribute after launch, and cutting Earth Science by $100M). The other $1B comes from growing the budget by $1B. Despite the above, unless they're going to really change those out-years from what they had internally very recently, I can't see how a significant amount of 2024 lander money comes from Gateway. At most, maybe $200M of that extra $2.0B comes from Gateway and associated Advanced Exploration Systems funds. $250M seems to come from Orion, $100M from ISS, and $500M from the Science budget (having most of Clipper dev funds leave Planetary Science upon launch, and having no big space telescopes listed in the budget after Webb launches). The other $1B comes from growing the budget by $1B. I don't think that 2.4 B is only for the lander. Why would this lander cost nearly twice what Orion costs on an annual basis, 3x what LOP-G does, and the same cost as a ~100 meter 8.4 meter diameter rocket. Advanced Cislunar and Surface Capabilities may include additional things yet to be fleshed out. Obvious possibilities just going by the name would be a lunar habitat or a lunar rover (The lunar surface suit is included here as well, but would not be a big percentage of the 2.4 B wedge). To be clear, that was shorthand for the Descent Element, Transit Element, Ascent Element, Refueling Element, and Surface Suit. These are the things that have been cited as being what make up ACSC. I think, knowing they want to launch the Descent Element in 2024 and an all-up test in 2026, and extrapolating that $2.4B out two more years to 2026 to get a total cost of $11B for NASA to lead an effort to develop the means to land on the moon again and test it unmanned, it's a rare example of reasonably correct budget estimation. That chart indicates that Orion is projected to cost 73% of the Apollo CSM development cost. Applying the same .73 factor to the LM 12-17B range would suggest 8.5B to 12.5B. The 73% factor being due to some of the technical difficulties that don't apply today, like the beyond state of the art 2 Mhz computer on the LM. 11B is still on the higher end of the scale being closer to the upper bound than the lower bound. edit: On the other hand, they have to procure 4 heavy lift launchers by 2026 which could easily end up being $1 billion and 1 and a half flight units which could also easily be another $1 billion.